I have no idea why I'm still at work. Well, actually, my wife just told me last Saturday that she's coming down to visit next Friday, so, I need to work late to make up time I'll miss since I don't have enough vacation time. HELLO! shouted the hoarse whisperer. That's a raw deal, @NGH. Glad to hear your wife's coming down though! The horse whispers back, @Doug. 99 balloons are nice, but if they’re the right ones, 6 will do. Liking the music I’ve dropped into here right away. Thanks for dropping in(to), @SBP! 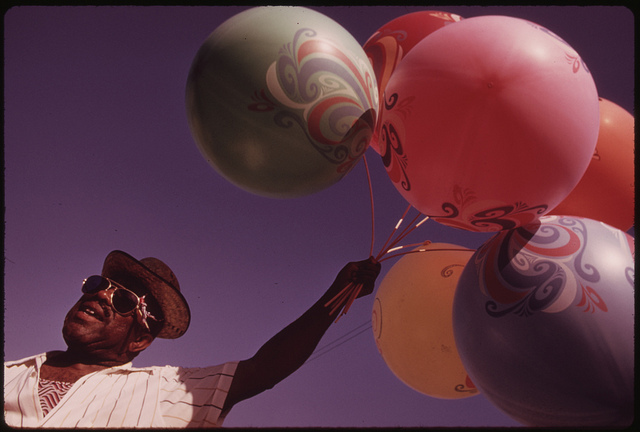 Pictured here is a balloon salesman from the Southside of Chicago in the mid-1970s. Sounds like the bassist was listening to A LOT of Seinfeld when recording this. Hahaha I love to just pop on an episode of Seinfeld on the headphones, put my phone in my pocket, and commute to work, @NGH! Speaking of excellent...ladies and gentlemen, Ike is here! FMU app needs a lost-headphone-finding function dabsmaffenfrigiffackel! They're not in your ears are they, @SBP? Sometimes I forget mine are in my ears and I think they're lost. No, I shined a flashlight into one ear and the beam passed right thru and out other ear onto wall. No bud blockage. Ok, leaving work, hear ya at home! This is no smoke up your kilt: this show tonight is hitting the right appeal buttons. BUT a full-ish accurate summary and stamp of wider personal taste...I’ve no idea how to describe that in a succinct suitable line. I can’t complete the assignment. Need a computer program that reviews all favorited tracks and arrives at the corresponding expression of profile. No, you don't need a "computer program." Nobody needs a "computer program." Your own "expression" is perfectly adequate. Oh, man, I'd love to see someone take all these taste algorithms from Spotify and Pandora and such and make them describe my taste in a sentence. Would obviously be way off, but would certainly be entertaining to read. I got 13.5 hours in at work today. It's been 7 years since I've had a job let me work more then 8 hours a day. I once saw Billy Bang play at the Stonewall Inn back in 2001, he killed. Didn't expect them to have free jazz shows there. There was maybe 30 people in the audience, seated at tables. Linguistic expression is frequently way off. That's the, pardon the pun, point. @SBP: There are no wrong answers on this assignment! I actually saw I-F live too, once., Cecile and Ornette, of course. Nope, I don't get paid for overtime, but I can make up for time I'm going to miss. Dinner tomorrow: chicken korma, very likely. Oh, one of my favorite Indian dishes, @Dean. Wonderful! Me, too. I like to sneak cinnamon into the korma, saffron into the rice. Thank you, Mr. Whirlwind! So glad to have you along for the ride with us.